This will surely be not my most readable post – if only because it’s soooooo long and – at times – quite ‘philosophical’. Indeed, it’s not very rigorous or formal, unlike those posts on complex analysis I wrote last year. At the same time, I think this post digs ‘deeper’, in a sense. Indeed, I really wanted to get to the heart of the ‘magic’ behind complex numbers. I’ll let you judge if I achieved that goal. Complex numbers: why are they useful? The previous post demonstrated the power of complex numbers (i.e. why they are used for), but it didn’t say much about what they are really. Indeed, we had a simple differential equation–an expression modeling an oscillator (read: a spring with a mass on it), with two terms only: d2x/dt2 = –ω2x–but so we could not solve it because of the minus sign in front of the term with the x. Using those complex roots, we wrote the general solution for the differential equation as Aeiωt+ Be–iωt. Now, note that everything is complex in this general solution, not only the eiωt and e–iωt ‘components’ but also the (random) coefficients A and B. However, because we wanted to find a real-valued function in the end (remember: x is a vertical displacement from an equilibrium position x = 0, so that’s ‘real’ indeed), we imposed the condition that Aeiωtand Be–iωt had to be each other’s complex conjugate. Hence, B must beequal to A* and our ‘general’ (real-valued) solution was Aeiωt+ A*e–iωt. So we only have one complex (but equally random) coefficient now – A – and we get the other one (A*) for free, so to say. Writing A in polar notation, i.e. substituting A for A = x0eiΔ, which implies that A* = x0e–iΔ, yields A0eiΔeiωt + A0e-iΔe–iω = A0[ei(ωt + Δ) + e–i(ωt + Δ)]. In the initial problem, our dependent variable x(t) was the vertical displacement, so that was a real-valued function of a real-valued (independent) variable (time). Now, we kept the independent variable t real – time is always real, never imaginary 🙂 – but so we made x = x(t) a complex (dependent) variable by equating x(t) with the complex-valued exponential ert. So we’re doing a substitution here really. Now, if ert is complex-valued, it means, of course, that r is complex and so that allows us to equate r with the square root of a negative number (r = ±iω). We then plug these imaginary roots back in and get a general complex-valued solution (as expected). However, we then impose the condition that the imaginary part of our solution should be zero. In other words, we had a family of complex-valued functions as a general solution for the differential equation, but we limited the solution set to a somewhat less general solution including real-valued functions only. OK. We all get this. But it doesn’t mean we ‘understand’ complex numbers. Let’s try to take the magic out of those complex numbers. Complex numbers: what are they? I’ve devoted two or three posts to this already (October-November 2013) but let’s go back to basics. Let’s start with that imaginary unit i. The essence of i – and, yes, I am using the term ‘essence’ in a very ‘philosophical’ sense here I guess: i‘s intrinsic nature, so to speak – is that its square is equal to minus one: i2= –1. That’s it really. We don’t need more. Of course, we can associate i with lots of other things if we would want to (and we will, of course! ), such as Euler’s formula for example, but these associations are not essential – or not as essential as this definition I should say. Indeed, while that ‘rule’ or ‘definition’ is totally weird and – at first sight – totally random, it’s the only one we need: all other arithmetic rules do not change and, in fact, it’s just that one extra rule that allows us to deal with any algebraic equation – so that’s literally every equation involving addition, multiplication and exponentiation (so that’s every polynomial basically). However, stating that i2= –1 still doesn’t answer the question: what is a complex number really? In order to not get too confused, I’ve started to think we should just take complex numbers at face value: it’s the sum of (i) some real number and (ii) a so-called imaginary part, which consists of another real number multiplied with i. [So the only ‘imaginary’ bit is, once again, i: all the rest is real! ] Now, when I say the ‘sum’, then that’s not some kind of ‘new’ sum. Well… Let me qualify that. It’s not some kind of ‘new’ sum because we’re just adding two things the way we’re used to: two and two apples are four apples, and one orange plus two more is three. However, it is true that we’re adding two separate beasts now, so to say, and so we do keep the things with an i in them separate from the real bits. In short, we do keep the apples and the oranges separate. Now, I would like to be able to say that multiplication of complex numbers is just as straightforward as adding them, but that’s not true. When we multiply complex numbers, that i2= –1 rule kicks in and produces some ‘effects’ that are logical but not all that ‘straightforward’ I’d say. Let’s take a simple example–but a significant one (if only because we’ll use the result later): let’s multiply a complex number with itself, i.e. let’s take the square of a complex number. We get (a + bi)2= (a + bi)(a + bi) = a·a + a·(bi) + (bi)·a + (bi)·(bi) = a2 + 2abi + b2i2 = a2 + 2abi – b2. That’s very different as compared to the square of a real sum a + b: (a + b)2 = a2 + 2ab + b2. How? Just look at it: we’ve got a real bit (a2 – b2) and then an imaginary bit (2abi). So what? Well… The thumbnail graph below illustrates the difference for a = b: it maps x to (a) 4x2 [i.e. (x + x)2] and to (b) 2x2 [i.e. (x + ix)2] respectively. Indeed, when we’re squaring real numbers, we get (a + b)2 = 4a2–i.e. a ‘real bit’ only, of course!–but when we’re squaring complex numbers, we need to keep track of two components: the real part and the imaginary part. However, the real part (a2 – b2) is zero in this case (a = b), and so it’s only the imaginary part 2abi = 2a2i that counts! That’s kids stuff, you’ll say… In fact, when you’re a mathematician, you’ll say it’s a nonsensical graph. Why? Because it compares an apple and an orange really: we want to show 2ix2 really, not 2x2. That’s true. However, that’s why the graph is actually useful. The red graph introduces a new idea, and with a ‘new’ idea I mean something that’s not inherent in the i2= –1 identity: it associates i with the vertical axis in the two-dimensional plane. Hmm… This is an idea that is ‘nice’ – very nice actually – but, once again, I should note that it’s not part of i‘s essence. Indeed, the Italian mathematicians who first ‘invented’ complex numbers in the early 16th century (Tartaglia (‘the Stammerer’) and da Vinci’s friend Cardano) introduced roots of –1 because they needed them to solve algebraic equations. That’s it. Full stop. It was only much later (some hundred years later that is!) that Euler and Descartes associated imaginary numbers (like 2ix2) with the vertical coordinate axis. To my readers who have managed not to fall asleep while reading this: please continue till the end, and you will understand why I am saying the idea of a geometrical interpretation is ‘not essential’. To the same readers, I’ll also say the following, however: if we do associate complex numbers with a second dimension, then we can associate the algebraic operations with things we can visualize in space. Most of you–all of you I should say–know that already, obviously, but let’s just have a look at that to make sure we’re on the same page. A very basic thing in physical mathematics is reversing the direction of something. Things go in one direction, but we should be able to visualize them going in the opposite direction. We may associate this with a variable going from 0 to infinity (+∞): it may be time (t), or a time-dependent variable x, y or z. Of course, we know what we have here: we think of the positive real axis. So, what we do when we multiply with –1 is reversing its direction, and so then we’re talking the negative real axis: a variable going from 0 to minus infinity (-∞). Therefore, we can associate multiplication by –1 with a full rotation around the center (i.e. around the zero point) by 180 degrees (i.e. by π, in radians). OK. Back to the main story line. 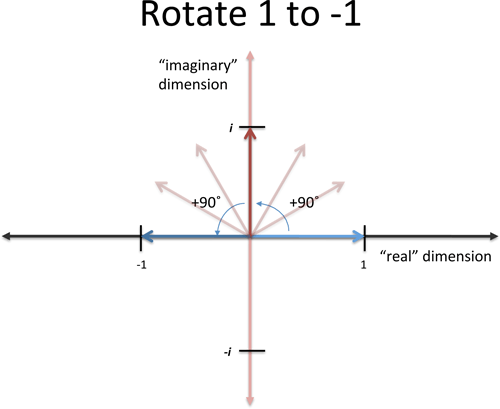 In order to understand complex numbers somewhat better, it is actually useful – but, again, not necessarily essential – to think of i as a halfway rotation, i.e. a rotation by 90 degrees only, clockwise or counterclockwise, as illustrated above: multiplication with i means a counterclockwise rotation by 90 degrees (or π/2 radians) and multiplication with –i means a clockwise rotation by the same amount. Again, the minus sign gives the direction here: clockwise or counterclockwise. It works indeed: i·i =(-i)·(-i) = –1. the imaginary unit adds a second dimension: instead of moving on a line only, we can now walk around on a plane. Huh? Well… Yes. Let me throw it in here straight away. You know this formula: it’s Euler’s formula. The so-called ‘magical’ formula! Indeed, Feynman calls it ‘our jewel’: the ‘most remarkable formula in mathematics’ as he puts it. Waw ! If he says so, it must be right. 🙂 So let’s try to understand it. Yes. It is ‘magical’. 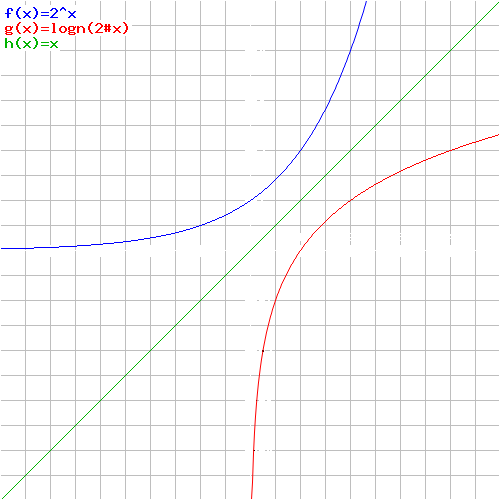 Associating eiθ – so that’s a complex exponential function really! – with the unit circle is something you learnt much later in life only, if ever. It’s a strange thing indeed: we have a real (but, I admit, irrational) number here – e is 2.718 followed by an infinite number of decimals as you know, just like π – and then we raise to the power iθ, so that’s i once again multiplied by a real number θ (i.e. the so-called phase or – to put it simply – the angle). By now, we know what it means to multiply something with i, and–of course–we also know what exponentiation is (it’s just a shorthand for repeated multiplication), but we haven’t defined complex exponentials yet. In fact… That’s what we’re going to do here. But in a rather ‘weird’ way as you will see: we won’t define them really but we’ll calculate them. For the moment, however, we’ll leave it at this and just note that, through Euler’s relation, we can see how a fraction or a multiple of i, e.g. 0.1i or 2.3i, corresponds to a fraction or a multiple of the angle associated with i, i.e. 0.1 times π/2 or 2.3 times π/2. In other words, Euler’s formula shows how the second (spatial) dimension is associated with the concept of the angle. […] And then the third (spatial) dimension is, of course, easy to add: it’s just an angle in another direction. What direction? Well… An angle away from the plane that we just formed by introducing that first angle. 🙂 […] So, from our zero point (here and now), we use a ruler to draw lines, and then a compass to measure angles away from that line, and then we create a plane, and then we can just add dimensions as we please by adding more ‘angles’ away from what we already have (a line, or a plane, and any higher-dimensional thing really). I feel I need to digress briefly here, just to make sure we’re on the same page. Dimensions. What is a dimension in physics or in math? What do we mean if we say that spacetime is a four-dimensional continuum? From what we wrote above, the concept of a spatial dimension should be obvious: we have three dimensions in space (the x, y and z direction), and so we need three numbers indeed to describe the position of an object, from our point of view that is (i.e. in our reference frame). Despite all that, time and space are fundamentally different things. Perhaps not for God – because He (or She, or It?) is said to be Everywhere Always – but surely for us, humans. For us, humans, always busy constructing that mental space with our ruler and our compass, time is and remains the one and only truly independent variable. Indeed, for us, mortal beings, the clocks just tick (locally indeed – that’s why I am using a plural: clocks – but that doesn’t change the fact they’re ticking, and in one direction only). And so things happen and equations such as the one we started with – i.e. the differential equation modeling the behavior of an oscillator – show us how they happen. In one of my previous posts, I also showed why the laws of physics do not allow us to reverse time, but I won’t talk about that here. Let’s get back to complex numbers. Indeed, I am only talking about dimensions here because, despite all I wrote above about the imaginary axis in the complex plane, the thing to note here is that we did not use complex numbers in the physical-mathematical problem above to bring in an extra spatial dimension. In fact, if we would have generalized to two- or three-dimensional space, we would have run into the same type of problem (roots of negative numbers) when trying to solve the partial differential equation and so we would have needed complex-valued variables to solve it analytically in this case too. So we would have three ‘dimensions’ but each ‘dimension’ would be associated with complex (i.e. ‘two-dimensional) numbers. Is this getting complicated? I guess so. The point is that, when studying physics or math, we will have to get used to the fact that these ‘two-dimensional numbers’ which we introduced, i.e. complex numbers, are actually more ‘natural’ ‘numbers’ to work with from a purely analytic point of view (as for the meaning of ‘analytic’, just read it as ‘logical problem-solving’), especially when we write them in their polar form, i.e. as complex exponentials. We can then take advantage of that wonderful property that they already are a functional form (z =reiθ), so to speak, and that their first, second etcetera derivative is easy to calculate because that ‘functional form’ is an exponential, and exponentials come back to themselves when taking the derivative (with the coefficient in the exponent in front). That makes the differential equation a simple algebraic equation (i.e. without derivatives involved), which is easy to solve. In short, we should just look at complex numbers here (i.e. in the context of my three previous posts, or in the context of differential equations in general) as a computational device, not as an attempt to add an extra spatial dimension to the analysis. Now, that’s probably the reason why Feynman inserts a chapter on ‘algebra’ that, at first, does not seem to make much sense. As usual, however, I worked through it and then found it to be both instructive as well as intriguing because it makes the point that complex exponentials are, first and foremost, an algebraic thing, not a geometrical thing. I’ll try to present his argument here but don’t worry if you can’t or don’t want to follow it all the way through because… Well… It’s a bit ‘weird’ indeed, and I must admit I haven’t quite come to terms with it myself. On the other hand, if you’re ready for some thinking ‘outside of the box’, I assure you that I haven’t found anything like this in a math textbook or on the Web. This proves the fact that Feynman was a bit of a maverick… Well… In any case, I’ll let you judge. Now that you’re here, I would really encourage you to read the whole thing, as loooooooong as it is. Exponentiation is nothing but repeated multiplication. That’s easy to understand when the exponents are integers: a to the power n (an) is a×a×a×a×… etcetera – repeated n times, so we have n factors (all equal to a) in the product. That’s very straightforward. If n is even, and a is a positive real number, we have two (real) nth roots a1/n: ± a1/n. However, if a is negative (and n is still even obviously), then we have a problem. There’s no real nth root of a in that case. That’s why Cardano invented i: we’ll associate an even root of a negative real number with two complex-valued roots. What if n is uneven? Then we have only one real root: it’s positive when a is positive, and negative when a is negative. Done. Given some value y and some number n, we can take the nth root of y (y1/n) to find the original base x for which y = xn. Given some value y and some number a, we can take the logarithm (to base a) of y to find the original exponent x for which y = ax. In the first case, the problem is: given n, find x for which y = xn. In the second case, the problem is: given a, find x for which y = ax. Is that complicated? Probably. In order to further confuse you, I’ve inserted a thumbnail graph with y = 2x (so that’s the exponential function with base 2) and y = log2x (so that’s the logarithmic function with base 2). 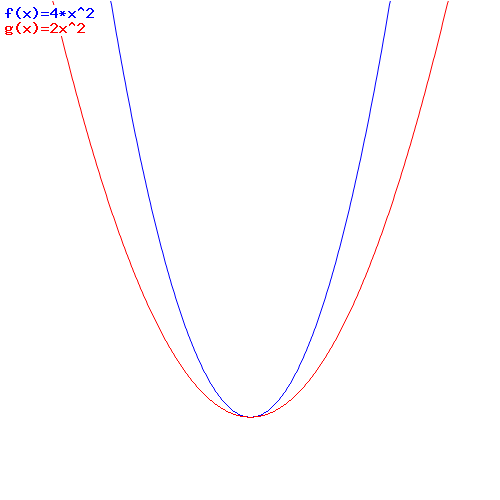 You can see these two functions mirror each other, with the x = y line as the mirror axis. We usually find logarithms more ‘difficult’ than roots (I do, for sure), but that’s just because we usually learn about them much later in life–like in a senior high school class, for example, as opposed to a junior high school class (I am just guessing, but you know what I mean). In addition, we have these extra symbols ‘log‘–L-O-G :-)–to express the function. Indeed, we use just two symbols to write the y = 2x function: 2 and x – and then the meaning is clear from where we write these: we write 2 in normal script and x as a superscript and so we know that’s exponentiation. But so we’re not so economical for the logarithmic function. Not at all. In fact, we use three symbols for the logarithmic function: (1) ‘log’ (which is quite verbose as a symbol in itself, because it consists of three letters), (2) 2 and (3) x. That’s not economical at all! Indeed, why don’t we just write y = 2x or something? So that’s a subscript in front, instead of a superscript behind. It would work. It’s just a matter of getting used to it, i.e. it’s just a convention in other words. Now, apart from us ‘liking’ exponential functions more than logarithmic functions because of the non-relevant fact that we learned about log functions only much later in our life, we will usually also have a strong preference for one or the other base for an exponential. The most preferred base is, obviously, ten (10). We use that base in so-called scientific notations for numbers. For example: the elementary charge (i.e. the charge of an electron) is approximately –1.6×10−19 coulombs. […] Oh… We have a minus sign in the exponent here (–19). So what’s that? Sorry. I forgot to mention that. But it’s easy: a–n = (an)–1 = 1/an. Our most preferred base is 10 because we have a decimal system, and we have a decimal system because we have ten fingers. Indeed, the Maya used a base-20 system because they used their toes to count as well (so they counted in twenties instead of tens), and it also seems that some tribes had octal (base-8) systems because they used the spaces between their fingers, rather than the fingers themselves. And, of course, we all know that computers use a base-2 system because… Well… Because they’re computers. In any case, 10 is called the common base, because… Well… Because it’s common. Stop! I am going way too fast here. We first need to define what irrational powers are! Indeed, from all that I’ve written so far, you can imagine what am/n is (am/n = am)1/n, but what if m is not an integer? What if m equals the square root of 2, for example? In other words, what is 10x or ex or 2x or whatever for irrational exponents? So we’ll use something like Dedekind cuts for irrational powers as well. We’ll define them as a sort of limit (in fact, that’s exactly what they are) and so we have to find some approximation (or convergence) process that allows us to do so. Ouf! So much stuff! But so here we go. We take base 10 and see how such an approximation of an irrational power of 10 (10x) looks like. Of course, we can write any irrational number x as some (positive or negative) integer plus an endless series of decimals after the zero (e.g. e = 2 + 0.7182818284590452… etc). So let’s just focus on numbers between 0 and 1 as for now (so we’ll take the integer out of the total, so to speak). In fact, before we start, I’ll cheat and show you the result, just to make sure you can follow the argument a bit. 100 = 1 and 101 = 10 etcetera. Most importantly, we know that 10m/n = (10m)1/n = (101/n)m for integer m and n.
In fact, we’ll use the second fact to calculate 10x for x = 1/2, 1/4, 1/8, 1/16, and so on and so on. We’ll go all the way down to where x becomes a fraction very close to zero: that’s the table below. Note that the x values in the table are rational fractions 1/2, 1/4, 1/8 etcetera indeed, so x is not an irrational exponent: x is a real number but rational, so x can be expressed either as a fraction of two integers m and n (m = 1 and n = 1, 4, 8, 16, 32 and so on here), or as a decimal number with a finite number of decimals behind the decimal point (0.5, 0.25, 0.125, 0.0625 etcetera). The third column gives the value 10x for these fractions x = 1/2, 1/4, 1/8 etcetera. How do we get these? Hmm… It’s true. I am jumping over another hurdle here. The key assumption behind the table is that we know how to take the square root of a number, so that we can calculate 101/2, to quite some precision indeed, as 101/2 = 3.162278 (and there’s more decimals but we’re not too interested in them right now), and then that we can take the square root of that value (3.162278). That’s quite an assumption indeed. Why do we stop after ten iterations? Well… Actually, there’s no real good reason to stop at exactly ten iterations. We could have 15 iterations: then x would be 1/215 = 1/32768. Or 20 (x = 1/1048576). Or 39 (x = 1/too many digits to write down). Whatever. However, we start to notice something interesting that actually allows us to stop. We note that 10 to the power x (10x) tends to one as x becomes very small. Now you’re laughing. Well… Surely ! That’s what we’d expect, isn’t it? 100 = 1. Is that the grand conclusion? That approximation is the last column in the table above. In order to show you how good it is as an ‘approximation’, I’ve plotted the actual values for 10x (blue markers) and the approximated values for 10x (black markers) using that 1 + 2.302585x formula. You can see it’s a pretty good match indeed if x is small. And ‘small’ here is not that small: a ratio like x = 1/8 (i.e. x = 0.125) is good enough already! In fact, the graph below shows that 1/16 = 0.0625 is almost perfect! So we don’t need to ‘go down’ too far: ten iterations is plenty! I’ve probably ‘lost’ you by now. What are we doing here really? How did we get that linear approximation formula, and why do we need it? Well… See the last column: we calculate (10x–1)/x, so that’s the difference between 10x and 1 divided by the (fractional) exponent x and we see, indeed, that that number converges to a value very near to 2.302585. Why? Well… What we are actually doing is calculating the gradient of 10x, i.e. the slope of the tangent line to the (non-linear) 10x curve. That’s what’s shown in the graph below. Working backwards, we can then re-write (10x–1)/x ≈ 2.302585 as 10x ≈ 1 + 2.302585x indeed. So what we’ve got here is quite standard: we know we can approximate a non-linear curve with a linear curve, using the gradient near the point that we’re observing (and so that’s near the point x = 0 in this case) and so that‘s what we’re doing here. Of course, you should remember that we cannot actually plot a smooth curve like that, for the moment that is, because we can only calculate 10x for rational real numbers. However, it’s easy to generalize and just ‘fill the gaps’ so to speak, and so that’s how irrational powers are defined really. Hmm… So what’s the next step? Well… The next step is not to continue and continue and continue and continue etcetera to show that the smooth curve above is, indeed, the graph of 10x. No. The next step is to use that linear approximation to algebraically calculate the value of 10is, so that’s a power of 10 with a complex exponent. It’s quite interesting. In his little chapter on ‘algebra’ (Lectures, I-22), Feynman just assumes that this ‘law’ that 10x = 1 + 2.302585x is not only ‘correct’ for small real fractions x but also for very small complex fractions, and then he just reverses the procedure above to calculate 10ix for larger values of x. Let’s see how that goes. 10x = 1 + 2.302585·Δ/1024 = 1 + 0.0022486Δ. The table below is the one that Feynman uses. The important thing is that you understand the first line in this table: 10i/1024 = 1 + 0.00225i·Δ = 1 + 0.00225i·1 = 1 + 0.00225i. And then we go to the second line: 10i/512 = 10i/1024·10i/1024 = 102i/1024 = 10i/512, so we’re doing the reverse thing here: we don’t take square roots but we square what we’ve found already. So we multiply 1 + 0.00225i with itself and get (1+0.00225i)(1+0.00225i) = 1 + 2·0.00225i + 0.002252i2 = 1 – 0.000005 + 0.45i ≈ 0.999995 + 0.45i ≈ 1 + 0.0045i. Note the minus sign in front of the real part, and look at the intermediate values for x and y too. Isn’t that remarkable? OK. Waw ! But… So what? What’s next? Well… To graph 10is, we should not just keep squaring things because that amounts to doubling the exponent again and again and so that means the argument is just making larger and larger jumps along the positive real axis really (see that graph that I made above: the distance between the successive values of x gets larger and larger, and so that’s a bad recipe for a smooth graph). So what can we do? Well… We should just take a sufficiently small power, i/8 for example, and multiply that with 1, 2, 3 etcetera so we get something more ‘regular’. 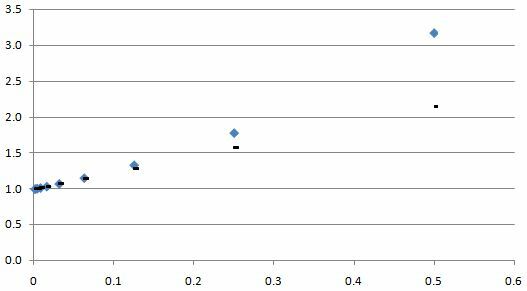 That’s what’s done in the table below and what’s represented in the graph underneath (to get the scale of the horizontal axis, note that s = p/8). Hey! Look at that! There we are! That’s the graph we were looking for: it shows a (complex) exponential (10is) as a periodic (complex-valued) function with the real part behaving like a cosine function and the imaginary part behaving like as a sine function. Note the upper and lower bounds: +1 and –1. Indeed, it doesn’t seem to matter whether we use 10 or e as a base: the x and y part oscillate between −1 and +1. So, whatever the base, we’ll see the same pattern: the base only changes the scale of the horizontal axis (i.e. s). However, that being said, because of this scale factor, I do need to say like a cosine/sine function when discussing that graph above. So I cannot say they are a cosine and a sine function. Feynman calls these functions algebraic sine and cosine functions. But – remember! – we can always switch base through a clever substitution so 10is = eit and recalculate stuff to whatever number of decimals behind the decimal point we’d want. So let’s do that: let’s switch to base e. WOW! What happens? So that’s it. End of story. You’ll say: So what? Well… Not sure what to say. I think this is rather remarkable. This is not the formal mathematical proof of Euler’s formula (at least not of the kind that you’ll find in a textbook or on Wikipedia). No, we are just calculating the values x and y of eit = x + iy using an approximation process used to calculate real powers and then, well… Just some bold assumption involving infinitesimals really. I think this is amazing stuff (even if I’ll downplay that statement a bit in my post scriptum). I really don’t understand these things the way I would like to understand them. I guess I just haven’t got the right kind of brain for these things. 😦 Indeed, just think about it: when we have the real exponential ex, then we’ve got that typical ‘rocket’ graph (i.e. the blue one in the graph below): just something blasting away indeed. But when we put i in the exponent (eix), then we get two components oscillating up and down like the cosine and sine function. Well… Not only like the cosine and sine function: the green and red line– i.e. 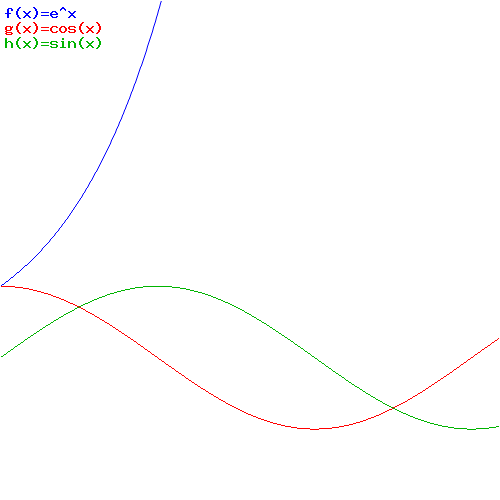 the real and imaginary part of eix!– actually are the cosine and sine function! The logic is pretty clear indeed. We have an exponential function here (y = 10x) and we’re evaluating that function in the neighborhood of x = 0 (we do it on the positive side only but we could, of course, do the same analysis on the other side as well). So then we use that very general mathematical procedure of calculating approximate values for the (non-linear) 10x curve using the gradient. So we plug in some differential value for x (in differential terms, we’d write Δx – but so the delta symbol here has nothing to do with Feynman’s Δ above) and, of course, we find Δy = 2.302585·Δx. So we add that to 1 (the value of 10x at point x = 0) and, then, we go through these iterations, not using that linear equation any more, but the very fundamental property of an exponential function that 102x = (10x)2. So we start with an approximate value, but then the value we plug into these iterative calculations is the square of the previous value. So, to calculate the next points, we do not use an approximation method any more, but we just square the first result, and then the second and so on and so on, and that’s just calculation, not approximation. But so that first step is ‘weird’ indeed. Why is it no problem whatsoever to insert the complex fraction s = i/1024 into 1 + 2.302585o·s, instead of the real fraction 1/1024, and then afterwards, to square these complex numbers that we’re getting, instead of real numbers? It just doesn’t feel right, does it? I must admit that, at first, I felt that Feynman was doing something ‘illegal’ too. But, obviously, he’s not. It’s plain mathematical logic. 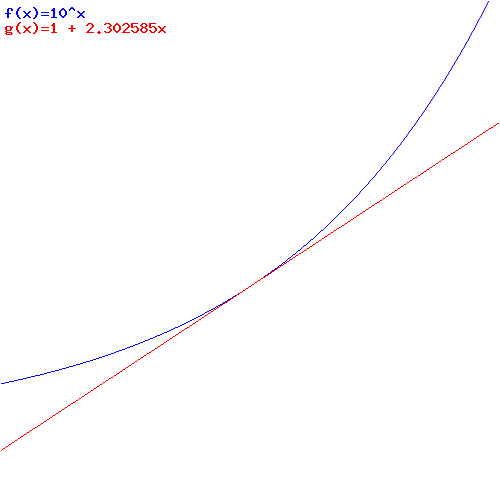 We have two functions here: one is linear (y = 1 + 2.302585·x), and the other is quadratic (y = x2) and so what’s happening really is that, at the point x = 0, we change the function. We substitute not x for ix really but y = 10x for y = 10ix. So we still have an independent real variable x but, instead of a real-valued y = 10x function, we now have a complex-valued y = 10ix function. However, the ‘output’ of that function, of course, is a complex y, not a real y. In our case, because we’re plotting a function really–to be precise, we’re calculating the exponential function y = 10x through all these iterations–we get a complex-valued function of the shape that, by now, we know so well. So it is ‘discontinuous’ in a way, and so I can’t say all that much about it. Look at the graph below where, once again, we have the real exponential function ex and then the two components of the complex exponential eix. This time, I’ve plotted them on both sides of the zero point because they’re continuous on both sides indeed. 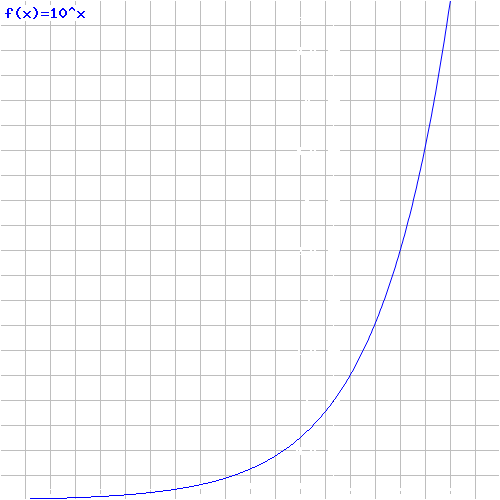 Imagine we’re walking along this blue ex curve from some negative x to zero. We’re familiar with the path. It has, for instance, that property we exploited above: as we doubled the ‘input’ (so from x we went to 2x), the ‘output’ went up not as the double but as the square of the original value: e2x = (ex)2. And then we also know that, around the point x = o, we can approximate it with a linear function. In fact, in this case, the linear approximation is super-simple: y = 1 + x. Indeed, the gradient for ex at point x = 0 is equal to 1! So, yes, we know and understand that blue curve. But then we arrive at point x = 0 and we decide something radical: we change the function! Yes. That’s what we’re really doing in that very lengthy story above: eix is a complex-valued function of the real variable x. That’s something different. 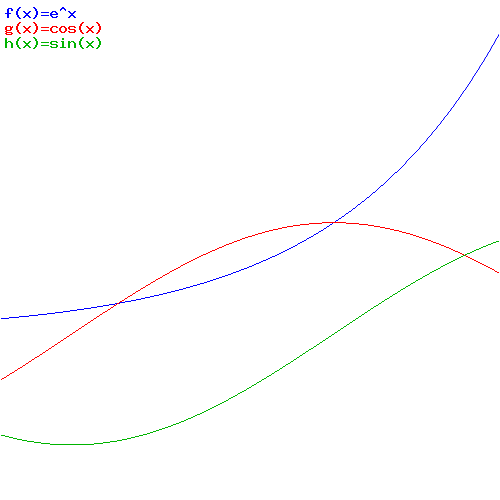 However, we continue to say that the approximation y = 1 + x must also be valid for complex x and y. So we say that eix = 1 + ix. Is that wrong? No. Not at all. Functional forms are functional forms and gradients are gradients: d(eix)/dx = ieix, and ieix at x = 0 is equal to ie0 = i! Hence, eix = 1 + ix is a perfectly legitimate linear approximation. And then it’s just the same thing again: we use that iteration mechanism to calculate successive squares of complex numbers because, for complex exponentials as well, we have e2(ix) = (eix)2. So. The ‘magic’ is a lot of ‘confusion’ really. The point to note is that we do have a different function here: eix and ex ‘look’ similar–it’s just that i, right?– but, in fact, when we replace x by ix in the exponent of e, that’s quite a radical change. We can use the same linear approximation at x = ix = 0 but then it’s over. Our blue graph stops: we’re no longer walking along it. I can’t even say it bifurcates, so to say, into the red and the green one, because it doesn’t. We’re talking apples and oranges indeed, and so the comparison is quickly done: they’re different. Full stop. I’ll probably never understand complex numbers in the way I would like to understand them–that is like I understand that one plus one is two. However, this rather lengthy forage in the complex forest has helped me somewhat. I hope it helped you too.